I was delighted that one of the BIG announcements at this year’s FIRST Championship was a new partnership between the Girl Scouts of America and FIRST. Every Girl Scout troop will now be supported and encouraged to form a robotics team. The young women on the Girl Scout’s existing teams will be tapped as mentors. There are already close to 100 Girl Scout FIRST LEGO League programs around the country to date. Two high-school-level Girl Scout teams competed in the World Championship finals in Atlanta. 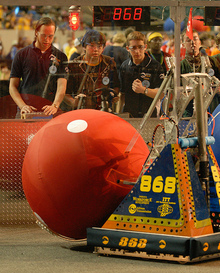 Emily Stephens, a senior at Perry Meridian High School in Indianapolis, tweaks the team's robot at the 2008 FIRST Robotics Competition—the team was a finalist for the Autodesk Inventor award. Seymour Papert is Critically Injured! I was dismayed to see this article in today's Boston Globe, MIT Scientist listed as Critical after Brain Surgery in Hanoi. Seymour Papert was run into by a speeding motorbike as he crossed the street in Hanoi and underwent brain surgery last night. My thoughts and best wishes for a miraculous recovery are with Seymour and his family. Seymour is the father of customer-led innovation in early childhood education. He is a pioneer in applied Artificial Intelligence. 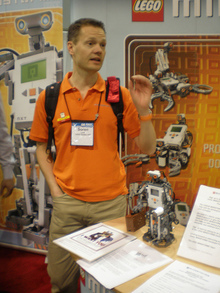 Among other accomplishments, Dr. Papert and his team of grad students at MIT invented the LOGO programming language for kids to use and the first child-powered robots--the forerunners of the LEGO Mindstorms product. Our prayers are with Seymour and his family!